The 360Charity Golf Tournament presented by Lovitt & Touché was held Friday, September 22nd at Longbow Golf Club for the second year. 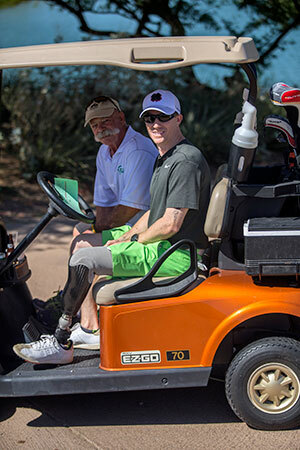 “Lovitt & Touché was honored to serve as the presenting sponsor for the 360Charity Golf Tournament. Ability360 holds a special place in our hearts, and it was with much pleasure that we helped the organization raise awareness and funds to support and empower people with disabilities,” said Lovitt & Touché CEO, Charles Touché. 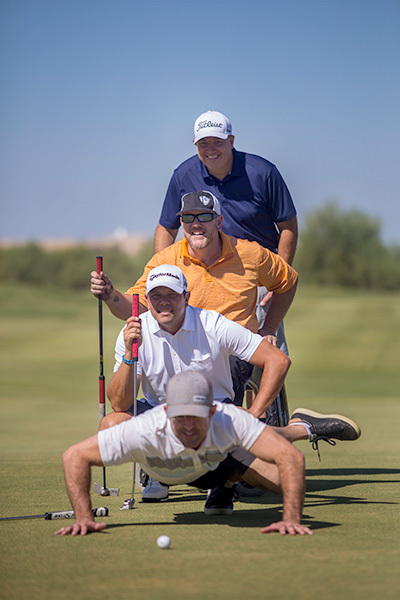 This year’s winning foursome was Josh Belkin, Morris Lippert, Blake Isakson and Tara Trzinski. Second place went to David Reese, Dr. Wayne Kuhl, Tim Bunn and Jason Graber. 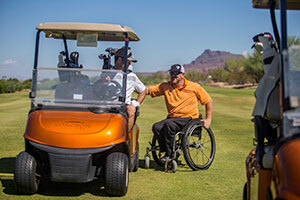 Each foursome included a member of the Ability360 community, both members and staff with and without disabilities, to put our mission of being inclusive for all into action as well as have an opportunity to educate the other golfers on Ability360 throughout the round of golf. We were honored to have many of our sponsors return this year. “This is my second year as a sponsor and participant of this great event. Ability360 provides an amazing platform for individuals with disabilities to become more independent. It also allows them to continue pursuing their dreams. 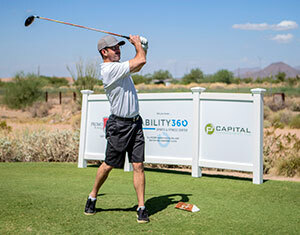 I am very proud to a part of this event and I look forward to continuing our support of Ability360 for years to come,” said Keith Gapusan, President and CEO of P3 Capital Management, LLC. The annual helicopter ball drop raffle was again a huge success with over 1,200 balls sold. The lucky first place winner of a Phoenix Suns luxury suite during the 2017-2018 season including 16 tickets and four parking passes was Katrina Hinsberg. The ultimate home tailgate party complete with a Sony 43-inch HD TV, catering services from Chef Michael and bartending services from Hey Bartender! LLC went to Jody Sarchett. And last but not least, Nick Pecors and a guest will enjoy the Greenskeeper package for two including one valet parking pass for Thursday, February 1, 2018 at the 2018 Waste Management Phoenix Open presented by the Ak-Chin Indian community. Special thanks to the Phoenix Suns, Acoustic Designs, Richard Howell, Chef Michael and Hey Bartender! LLC and Thunderbirds Charities for their generous donations to this fundraiser. With the continued support of the community, Ability360 is impacting lives and growing daily! In the past year, membership has reached over 2,000 at the Sports & Fitness Center. The Center is gaining national attention and was the proud host of the USQRA National Quad Rugby Championships in April 2017. They will again host this event in April 2018. 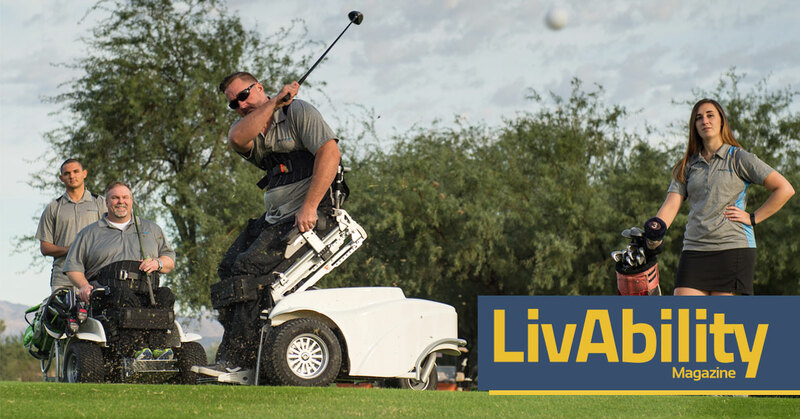 “I’d like to thank all of our contributing sponsors, especially our lead sponsor Lovitt & Touché, and our event host, our friends at Longbow Golf Club. I would also like to thank all of our volunteers who have worked so hard to make today’s charity golf tournament a huge success. We are so grateful and appreciative of the generosity and support we have received,” said Ability360’s President and CEO, Phil Pangrazio.